Brahma Sutras is a very famous text and the main text in the Vedanta tradition and it is believed they were written by Rishi Ved Vyasa, but there are points which say they were not written by Rishi Ved Vyasa. However, the author mentioned in the Brahma Sutras is 'Badarayana'. The Brahma Sutras mention Buddhism and Jainism where as Sage vyasa lived long ago when Buddhism and Jainism were nonexistent. It has some verses which are considered written against Agamas, but Sage Vyasa Himself praised agamas in Mahabharata, the Linga Purana, Shiva Purana which are all written by Vyasa too also praises Agamas. Even many rituals mentioned in Shaivite Puranas are Agamic. So how can people claim and why is it believed Brahma Sutras were written by Sage Rishi Ved Vyasa? According to Kanchi Paramacharya (Chandrashekarendra Saraswati) too, Veda Vyasa and Badarayana are the same person. He mentions about this in this chapter of the book called "Hindu Dharma", which is comprised of his various speeches/talks. In the Brahmasutra, on which there are commentaries according to the various philosophical schools, Vyasa presents in an extremely terse form the substance of the ten (principal) Upanisads. Since he dwelt under the badari tree (jujube) he came to be called "Badarayana" and his work became well-known as "Badarayana-sutra". Who or what is man (the individual self)? And, besides that, the Devi Bhagavatam explicitly mentions Veda Vyasa as the author of the Vedanta Darshana Sutras (which is another name for the Brahma Sutras). Seeing this distressed and sorrowful state of his father, S'ûkdeva, with eyes full of wonder, said :-- Oh! What a power has Mâyâ got? Oh! He, whose words are accepted by all, with great love and care as equivalent to the Vedas, who is the author of the Vedânta Dars'ana, and before whom nothing is veiled in ignorance, Oh! that greatest Pundit, the knower of all the Tattvas, is now deluded by Mâyâ? Oh! what is that Mâyâ who has been able to delude Vyâsa Deva, the son of Satyavati, so skilled in the knowledge of Brahmâ Vidyâ; I also do not know how, with what great care, one is to practise Sâdhanâ towards Her. Alas! He who has composed eighteen Mahâ Purânas and the great Mahâ Bhârata, who has divided the Vedas in four parts, the same Veda Vyâs has today been deluded by the power of Mâyâ! What to speak of other persons! So, here Veda Vyasa is mentioned as the person who was deluded by Maya. He is mentioned as the author of Vedanta Darshana as well as the author of the 18 Puranas, the Mahabharata and also as the person who has divided the Vedas. Therefore, this also shows that Badarayana is in fact Veda Vyasa. The possible explanation of your question is provided by author of the book Vedanta-Darshan (Brahma Sutra) Harikrishna Das Goyandaka by Gita Press. In his introduction of the book , the author is precisely talking about your question and the doubts regarding this matter. 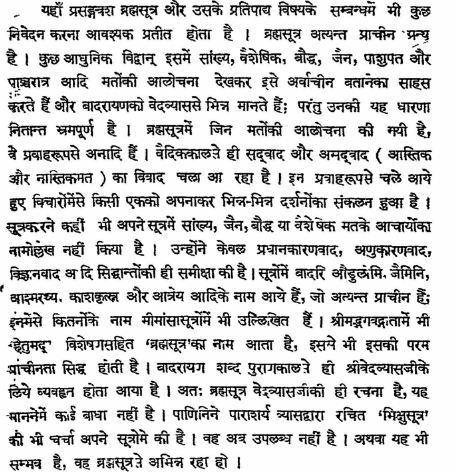 According to the author ,there is no problem in believing that the brahma sutras were authored by Ved -Vyasa whoes other name is also Badarayana. Below is the english translation of the explanation from the book. Samkhya , Vaisheshika ,Boudha, Jaina , Pashupata and Pancharatra were eternal thoughts /views. They later formed their respective schools , but initially they were views only , before they got their seprate exsistance. Bikshu-Sutras was the one of the name of Brahma-Sutras written by Ved-Vyasa (son of parashara muni) ,which is mentioned by Panini . Ved-Vyasa OR Badarayana only reviewed these thought /view systems and not the religions or philosophical schools. This proves that Brahma sutras were written By Sage Rishi Ved Vyasa , whoes another name is Badarayana. And they both are same. And Buddhism and Jainism etc. mentioned /criticized were views /thoughts ,which are present from the beginning i.e. Astika VS Nastika. 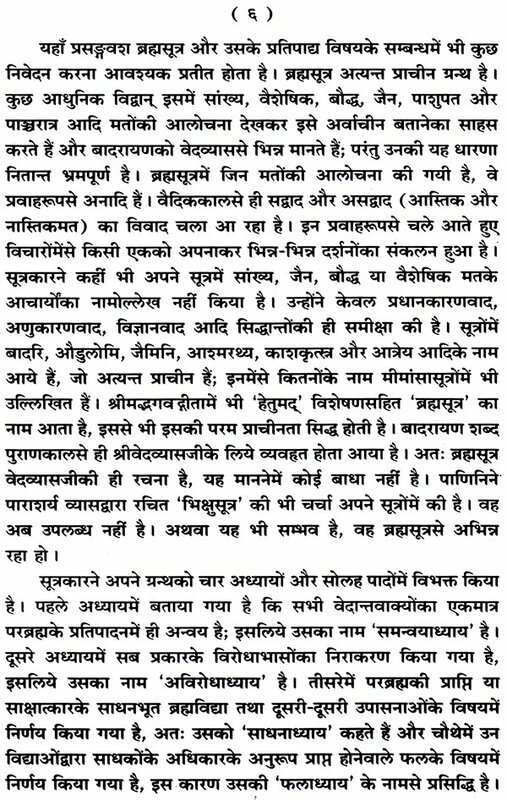 Here is the screenshot of the above introduction in Hindi. In Puranas also Shree Ved-Vyasa is called as a Badrayana. For example Shreemad Bhagvat Purana calling Rishi Ved-Vyasa as Badaryana in the following Shloka. O suta ! Whatever the venerable Badrayana greatest among the learned ones ,knows and whatever other sages who knows saguna and nirguna brahman. Now see the footnote clearing declaring Ved-Vyasa the author of Brahma Sutras is same as Badrayana. see p.19. Not the answer you're looking for? Browse other questions tagged scripture brahma-sutras vyasa . What is the story of Badarayana Vyasa? What kind of scripture is Vyasa's BrahmaSutras technically?